Microsoft is making a new Mail feature available on Windows 10. With the latest Insider Preview build, you can now turn off conversation view in the Mail app. The bad news is that you won't have access to this feature unless you're an Insider willing to test software for Microsoft ahead of commercial availability. When Microsoft debuted the new Mail client on Windows 10, all emails were grouped into conversations by subject, rather than by time stamp. Unfortunately, Microsoft did not give users the option to turn off conversation view, at least until now. Given that the feature is being tested by Windows Insiders, it could eventually make it into the next big Windows 10 release. Microsoft has a planned OS update for November, and this could introduce conversation view into Mail for all users. Mail is one of a number of apps that Microsoft redesigned for Windows 10. Together with Calendar and People, these apps deliver similar experiences to the Outlook app that Microsoft had launched for iOS, Android and Windows 10 Mobile. On Windows 10, these apps offer better support for non-Microsoft services, like synchronizing People contact information with Google. With the Mail experience, another feature that is lacking is a unified inbox. The current setup does not allow you to view emails across different email accounts. If you have more than one email account, you still need to switch between them. Enterprise customers who need a more powerful email and personal information management system can always use the Outlook program that comes with Office 365. With the launch of Windows 10, Microsoft is changing its strategy with Windows. Rather than delivering Windows as a software product, Microsoft is positioning it as a service. This means that the product will receive continuous updates. Updates will automatically download in the background and get installed when they're ready. Unfortunately, this means that you can't skip an update if you don't like what it does, but Microsoft has shown that it is listening to its users to deliver positive experiences. 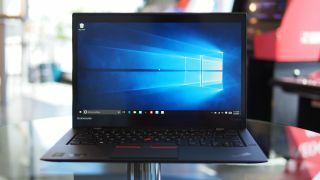 The OS is available free to owners upgrading from Windows 7, 8 or 8.1 during the first year of release, and the promotional offer has attracted more than 75 million installs in just less than a month. Will developers embrace Universal apps?